ABF Outlook Backup can be easily used to transfer and synchronize Outlook between several computers, different Windows versions or users. You can also use this program to migrate to a newer or older version of Outlook. All you need is to backup Outlook on one computer (user or OS) and restore it to another one. ABF Outlook Backup has user-friendly wizard-style interface (Figure 1) which will guide you trough backup and restore processes. Even a beginner can easily work with this program. Figure 1: ABF Outlook Backup. 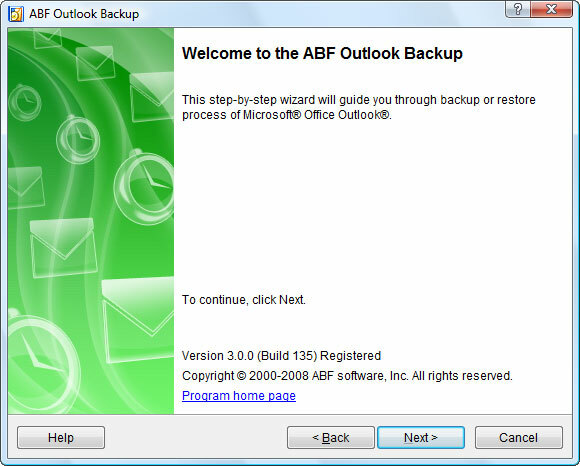 ABF Outlook Backup is very easy to use. Simply follow the backup or restore wizard and you will get the process done. See backup and restore topics for details. Help manual for ABF Outlook Backup software. Copyright © 2008 ABF software, Inc. All rights reserved.